The management of Victory Liner Inc., the owner of a bus that was involved in a road mishap here Saturday night that killed three persons and seriously injured five others were offered financial assistance to families of the victims. 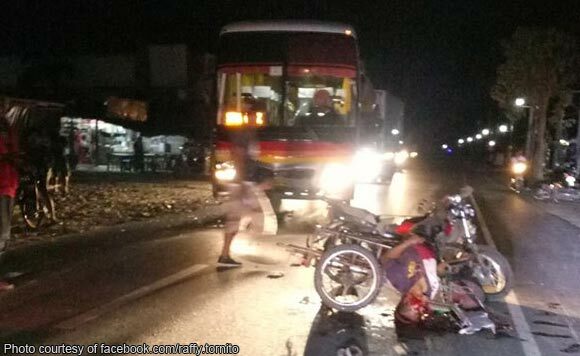 Pocholo Galian, general manager of the company, said in an interview on Monday, said they were ready to extend financial or medical assistance to victims of road accidents involving their buses, even though there are instances wherein their drivers were not supposed to be held liable. “It is our policy to always extend financial help to those in grieve, regardless if the loss of life or injury is the fault of our drivers or not. What is important is we were able to ease the effect of the accident to the aggrieved,” Galian said. The financial assistance will cover medical and burial expenses, plus P180,000 in cash. This is in accordance with the agreement made between the bus driver and relatives of the victims during a meeting held Monday at the fiscal’s office. With the agreement, the relatives withdrew criminal charges against the bus driver so that financial assistance could be availed immediately. Based on the investigation, Tilyong Arbizo was driving his tricycle along the national highway with passengers Michelle Arbizo, 9, and Daniel Arbizo, 8, Belong Arbizo, 10; Mikoy Arbizo, 4; Mika Arbizo, 3; and a woman not readily identified, all of Barangay Mapalad, this town. Upon reaching Barangay Lipay, a motorcycle driven by Justy Mendoza of Barangay Tubo-Tubo South, Sta. Cruz, suddenly swerved and skidded on the road.